When it’s time to have locks installed on your doors, consider hiring Dallas FW Locksmith. Residential and commercial properties use deadbolt locks and mortise locks most commonly. Either is a good option for a basic lock for general protection. Additional security, like an alarm system, can help deter potential crime. A professional locksmith can install and repair your locks, no matter the variety. Have your mortise locks installed professionally by Dallas FW Locksmith to ensure that your locks are installed correctly the first time. At Dallas FW Locksmith, we serve Dallas-Fort Worth, TX and surrounding areas, offering a complete locksmith service. We provide a 24/7 locksmith service employing expert technicians with 5+ years of experience. We pride ourselves on being a licensed, bonded, and insured locksmith company operating with several institutionalized standards. We always deliver fast and friendly service with up front pricing so our customers always know what to expect. With our 30 min response time, they also know we’ll respond quickly to their locksmith needs. While we provide all types of locks to our customers, the mortise lock is one of our most popular styles of door locks. Our technicians are equipped to install one of these locks in minutes after their arrival. We highly advise hiring us to do the job because an expert installation of a mortise lock can eliminate the inconsistencies of self installations. Precision cutting and specialized equipment are needed to cut a perfect-fitting mortise in the door frame. Excellent locksmith techniques are also needed to fit the lock and test its functionality. We understand the intricate function of a mortise lock making sure you receive the full double protection it provides. Mortise locks are constructed by installing a metal box keep in the doorjamb that receives the lock body. The lock body is composed of one or two locking mechanisms – the lock bolt and/or the sprung latch. Each of these elements adds security features to the mortise lock, ensuring the safety of the inhabitants on the premises. These details also make mortise locks very popular for use in many homes and businesses. Residents and businesses in the Dallas-Fort Worth area can take advantage of our locksmith services 24 hours a day, 7 days a week. We understand that convenience is a very important feature for the type of service we provide. That’s a major reason we also have mobile locksmiths working night and day to respond quickly to all calls. Our goal is to please the customer and to offer convenience is every aspect of our business. That’s the reason for our up front pricing, our expert technicians, and our fast and friendly service. Whether your home or office in Dallas and Fort Worth, TX and surrounding areas is secured with mortise locks, deadbolts, or swipe card entries, we have the expertise to repair it or install a new lock of equal or greater security. Our complete locksmith service is qualified to unlock, repair, and replace every known type of locking mechanism for premises. Call us for all your lockouts, lost keys, broken keys, and compromised or non-working locks. We have a standard 24/7 locksmith service and we respond quickly to all calls averaging a 30 min response time. Our mobile locksmiths carry the tools needed for the majority of the jobs we are asked to do, making each call fast and successful. At Dallas FW Locksmith, we are continually expanding in the area. Having an excellent locksmith service headquartered in a growing metropolis inspires our positive outlook for the future. Dallas and Fort Worth residents and businesses can rest assured that we can meet your locksmith needs in the event that you have an emergency lockout, need a new lock installed, or experience another situation requiring a locksmith. Our experienced technicians will respond to the call and you can quickly resume your daily activities knowing you have a functioning, secure lock able to provide protection for your family, employees, and possessions. 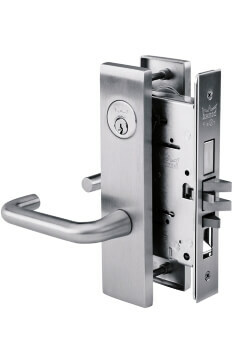 Mortise Lock Installation and Repair http://dallasfwlocksmith.com/mortise-locks/ 4.0/5 based upon 21 reviews.